The PBE has been updated! As we continue the 9.4 PBE cycle, today's patch includes more tentative balance changes! Death Mark (R) Passive effect Reaper of Shadows removed. 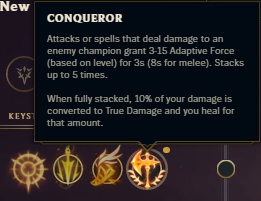 [Tooltip clarified] "Attacks or spells that deal damage to an enemy champion grant 3-15 Adaptive Force (based on level) for 3s (8s for melee). Stacks up to 5 times. When fully stacked, 10% of your damage is converted to True Damage and you heal for that amount." "Thats a mistake on live atm. its is supposed to be 50 - 70% ad (but accidentally got changed to 55-75% a few patches ago), and it looks like surrender@20 scrapped the data incorrectly?" 2) Make sure to check out Meddler's quick gameplay thoughts for February 8th!